Print quality is very good, but the mastering is weak: the image is hazy and colors slightly muddy, with video noise apparent in the darker scenes. Features commentary by Tinto Brass in such heavily-accented English it’s sometimes difficult to understand exactly what he’s saying. Which is fine, given that it’s just as difficult to understand the plot of the film. Also, check out this loving remembrance of the film and its brief American release. Michael Reeves only directed three features before his untimely death. Witchfinder General is a minor classic. The Sorcerers is a cult item. And then there is The She-Beast (1966), his directorial debut. Shot in Italy on a miniscule budget, it’s an oddity passing as a horror film with the help of sixties B-movie icon Barbara Steele, the Italian horror princess of eerie beauty and haunting eroticism. Not that she’s actually in the film much. After the opening scenes establishing the curse left on a Transylvanian village by a grotesque witch with a snaggle-toothed snarl, a wild fright wig and a face that seems to be rotting on the skull, Steele drives into this Eastern bloc village in a VW Beetle with her husband (Ian Ogilvy, in his feature debut) on their honeymoon. Good choice of vacation spot, kids. They take a room in an ancient inn run by a pig of an owner (Mel Welles) who peeps in on their honeymoon night, sabotages their car and molests his own nieces. Yes, he gets his when the witch returns (and Steele disappears for the bulk of the film ““ she reportedly shot all of her scenes in a single day) and Ogilvy teams up with a descendent of Van Helsing (John Karlsen) to complete the exorcism and bring his wife back. Roger Corman screenwriter Charles B. Griffith (of Little Shop of Horrors and Bucket of Blood fame) gave the script an uncredited polish and is probably responsible for the comedy of provincial peasants spouting communist rhetoric and mangling English conversations, and the dry humor of the British couple’s responses. It tips right into bad Keystone Kops komedy when they have to steal the witch (played by American dancer Jay “Flash” Reilly, who give this groaning hunchback a very spry attack) from the local cops, the boss yelling socialist clichés while his incompetent lackeys literally trip over nothing and the car chase sped up silent-movie style. It’s the low point in a movie that has its entertaining moments of strange character bits and wry humor, but is more interesting in showing how much can be created for so little (producer Paul Maslansky remembers the production costing at $38,000). The anamorphic widescreen disc is mastered from a vault 35mm print, which is generally clean with strong color but for the opening and closing footage, which is worn and speckled with scratches and shows minor splicing. For genre fans, the commentary track is the real treat. 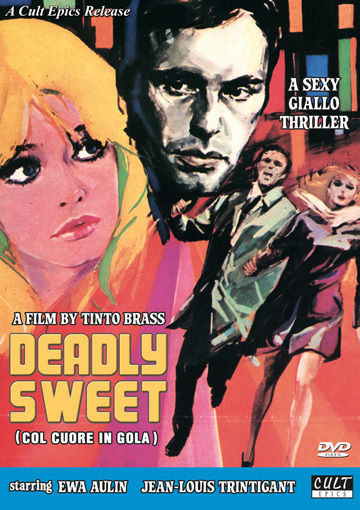 Ian Ogilvy (who is an old hand at this) is a lively presence with lots of stories and entertaining observations, which spur on remembrances by producer Paul Maslansky and co-star Barbara Steele (who arrives about fourteen minutes into the track). In the opening scene of JCVD, Jean-Claude Van Damme takes out one heavily-armed, vaguely military bad guy after another with his bare hands (and whatever blunt instruments and discarded weapons he grabs along the way) in an elaborately choreographed long take. He comes out the other end huffing and winded as the set falls down around and ruins the take. “It’s hard for me to do it all in one take,” he begs the arrogant, snotty young director. “I’m 47 years old.” And we can see the toll that age, exertion and high-living have taken. JCVD is not a biography, though Belgian-born Jean-Claude Van Damme does in fact play a martial arts champion and aging action movie star who returns home to Belgium while he’s embroiled in a brutal custody battle over his daughter and struggling with a film career sliding into cheap international flicks and direct-to-DVD productions. It’s not exactly an action thriller, though there is a heist-turned-hostage situation a la Dog Day Afternoon, with JCVD smack in the middle and a growing crowd shouting their support for their favorite son (the cops assume that he’s the leader of the gang). And it’s not quite a satire, though Van Damme allows director Mabrouk El Mechri to lay waste to his film career in sardonic comments and his life in self-lacerating scenes. 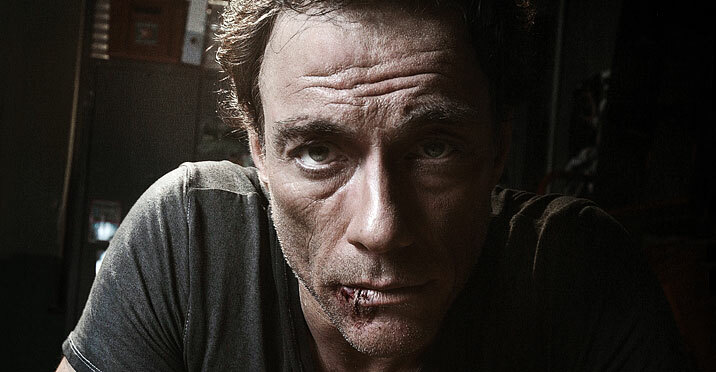 JCVD is an action film where the flamboyant heroics occur only in fantasy. Van Damme’s most daring stunt is a monologue dropped into the middle of the movie, a self-pitying apologia, where he spins his story of a simple Belgian martial arts champ seduced by Hollywood, the naive innocent destroyed by the liars and corrupted by the sudden fame and decadence. It plays like Van Damme’s version of Bela Lugosi’s “Home? I have no home!” speech in Ed Wood’s Bride of the Beast, with Van Damme showing his thespian skills by letting a single tear roll down his cheek up as he rakes over the coals of his screwed-up life. His dramatic muscles are awfully creaky and it’s hard to tell if it’s achingly pretentious, deadpan self-parody or merely Van Damme’s idea of screen test. But that ambiguity makes the scene so much more interesting and Van Damme is surprisingly engaging as a version of himself who is more vulnerable human being action hero as he tries to survive an armed gang of unraveling personalities. In the real world, he’s more apt to talk than take on a trio of thugs with guns. It’s his first feature in French, his native language. And he manages to maintain self-effacing dignity in the face of director/co-writer Mabrouk El Mechri’s take on his troubled private life. It’s an impressive stunt that pays off in an action film for art movie aficionados and a foreign film for the popcorn crowd. As long as they don’t mind reading subtitles. The DVD supplements are limited to a pair of deleted scenes and the option of the French language theatrical version (where Van Damme does some scenes in English) or an English dub version. This latter is very distracting, as his English scenes are left intact but another (uncredited) actor dubs over his French scenes. And no, it doesn’t really sound much like the voice were used to hearing come from the Muscles from Brussels. It was inevitable: the great lo-fi sci-fi landmark TV series of the sixties gets a high definition release. These are the original voyages of the Starship Enterprise and its legendary bridge crew, as well as newly buffed-up presentations with enhanced special effects and sound effects, all redone with digital technology designed with a retro-look; the producers have been careful to match the look and style with the rest of the show. In a side-by-side comparison, the differences are startling, but in the context of the shows the new footage is well integrated into the existing footage, matching the style and sixties color scheme while giving the ship a more substantial, solid feel. But you don’t have to choose one over the other; the Blu-ray release features both the newly reworked editions (previously put out on DVD) and the original, unretouched versions in all their low-tech glory for nostalgics, purists and Trekker obsessives. The series opens with Man Trap, a classic Trek story of alien encounters and interstellar morality with a cast of characters in the early stages of narrative evolution. As the actors settled into the characters and the writers settled into the universe, the series developed into the iconic show still beloved by so many, with such season highlights as Balance of Terror (a battle of wits and strategy with the Romulans, in their first series appearance), Shore Leave (an amusement park of the mind, scripted by Theodore Sturgeon), Arena (Kirk versus the lizard man in a macho battle to the death, adapted from the famous Fredric Brown short story), Devil in the Dark (one of the episodes that shows Roddenberry’s desire to twist stereotypes and create unexpected, peaceful resolutions to alien clashes), and the award-winning City on the Edge of Forever, scripted by Harlan Ellison). Other favorites include Mudd’s Women, which introduced interstellar conman Harry Mudd (played by Roger C. Carmel and still one of the favorite guest characters), Miri (“Bang, bang, on the head!”), The Corbomite Manuever (a deadly stand-off with an alien ship), and Space Seed (with Ricardo Montalban as a genetically engineered superman; the episode inspired Star Trek II: The Wrath of Khan). All 29 episodes are collected on seven discs in a simple, efficient case with hinged trays. Paramount apparently finally gave up on concocting unique new packages for the sets. Past designs have been eye-catching but awkward and impractical. This is simple and easy to use and fits right into your DVD shelf. New to Blu-ray is “Starfleet Access,” a viewing mode that adds picture-in-picture interviews and pop-up trivia for five episodes. Also includes various featurettes, interviews, galleries of stills and art and other supplements from the previous DVD release. Frost/Nixon: The Complete Interviews, from Liberation, collects all four interview programs conducted with Richard Nixon by British talk show host and journalist David Frost and broadcast in May 1977, plus a bonus program created from unused interview footage for the PBS rebroadcasts in the early 1980s. See my review on seanax.com. Criterion releases Stephen Frear’s brilliant sun-drenched noir The Hit (which arguably kicked off the crime genre that D.K. Holm has dubbed “film soleil”) and two of Nagisa Oshima’s more notorious films, In The Realm Of The Senses (1976) and Empire Of Passion (1978). (Realm is also available in Blu-ray.) See David Coursen’s essay on Realm on Parallax View here. Patrice Leconte’s The Hairdresser’s Husband (1990) and The Perfume Of Yvonne (1994), the second and third films of his “obsession trilogy,” debut on DVD from Severin, with Yvonne available for the first time to American audiences. New releases include Bride Wars (Fox) and Hotel For Dogs (Dreamworks), and The Da Vinci Code: Extended Cut and The Reader debut on Blu-ray.